I have to go shopping. I have no xanthan gum left in the house and very little flax seed for egg replacement. I have very few gluten free flours ready to be used in my house; I gotta get out my grain grinder, but I'm being a little lazy about that. So for lunch today, I said I'd use what I have already on hand... I had brown lentil flour already ready, and since I've made brown lentil falafel before from whole lentils, I was sure it would work also from lentil flour. To get a basic idea how to make this recipe, I searched for a recipe for falafel made from chickpea flour/garbanzo bean flour, and came up with this one from Bob's Red Mill, which I then tweaked to make it more to my liking. (What? No turmeric in their falafel? That's like the base of authentic falafel balls!) I like my falafel balls extra flavorful, but feel free to use less of the spices if you prefer a blander variety. I've included instructions in case you want to soak your flour overnight, as per WAPF (Nourishing Traditions/traditional foodies) guidelines to reduce phytic acid content and make it more digestible, but if you want to make it quicker, feel free to skip that step. I served mine with a cucumber tomato salad dressed with lemon, oil, salt, and garlic, and with tahini dipping sauce (recipe here). You deep fry these, fry in a little oil, or even bake these in the oven, however you chose. These are GAPS diet legal if you make them with lentil flour. 1. Mix the lentil or garbanzo flour with water and lemon juice. Let sit 12 hours or longer, ideally in a warm place. Alternatively, skip this step and just use boiling water and let this sit for 10 minutes. 2. Add the rest of the ingredients other than the extra water and oil. 3. Mix well. If too dry, add an extra tablespoon or two of water. 4. If deep frying, heat up a few inches of oil on high, (I use palm or coconut, as its stable at higher temperatures), and when very hot, wet your hands and form small balls, then drop them in the hot oil. When mostly browned, flip over, and cook on the other side, then remove from oil. When doing this, the inside will be moister. Alternatively, cook them on medium low- they'll be fluffier and dryer on the inside. 5. If not deep frying, form into small patties and fry until browned on one side, then flip over and brown the other side. 6. If baking, make small balls, place on a lined cookie sheet, and bake at 350 until browned and solid. 7. Serve either alongside salad and with a tahini dipping sauce, or in a pita or wrap with salad and tahini sauce. 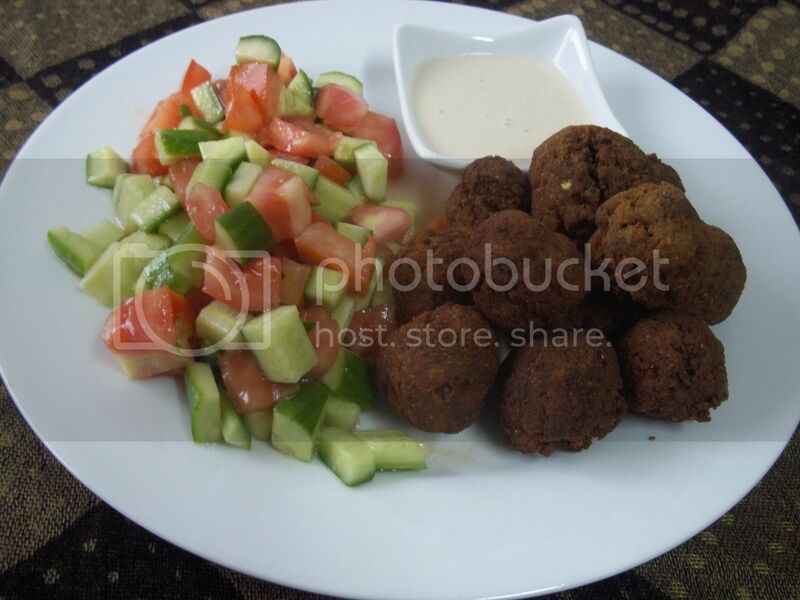 Have you ever eaten falafel? Have you ever made it before? Does this look like a recipe you'd try out? Would you try out the lentil or the chickpea flour variety?